"High Tea and champagne in Albany - Lovely!" The High Tea Inspectors left stifling hot Perth and headed to a fresh and invigorating Albany for the booked out event (held every three months), Liberté High Tea. We were shown into a most elegant room with outstanding table settings (refer photo below). The staff that attended to us were all very pleasant and accommodating, with several high maintenance attendees from amongst my group- ha! A three tiered stand of afternoon tea delights along with a glass of champagne awaited the high tea lovers, with lots of people looking quite splendid for the event which is always a nice touch. 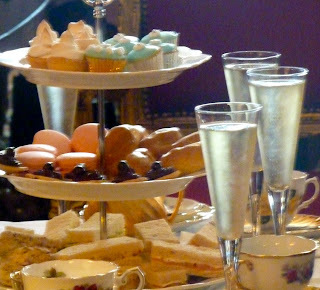 The champagne was flowing freely along with tea and coffee all complemented by the sandwiches and cakes offered. I particularly enjoyed the macaroons, quite delicious. The string quartet playing background music was enjoyable and contributed to a very fine afternoon. This event is well organised and a credit to the staff. The Liberté high tea is offered about four times a year. So if your planning a trip to Albany maybe phone ahead and check out when they are holding the next high tea at the Liberté. You could be lucky. We all agreed it was a most enjoyable way to spend Sunday afternoon in Albany.